It's been a long and cold winter and I can honestly say that in spite of loving my pashminas and coats, I'm tired of wearing wool! I am starting to feel the promise of warmer days and lovely, tranquil evenings just around the corner with every passing day and new bud that appears on my cherry trees in my backyard. However, I would be hugely remiss if I didn't attribute much of my optimism and happiness of this Easter weekend to the gift of new life...HIS life. 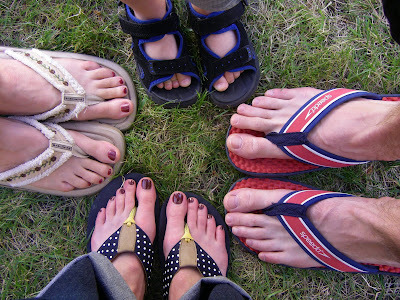 Easter in southern California is interesting and enjoyable...it's just always a shock to me remembering they have only ONE season down there - Flip Flops! So…when in Rome, no? I mean, you really can't play at the beach wearing anything but these sacred, rubber-pieced-together little beauties - they exemplify smiles and sunshine, don't they? On Good Friday it's imperative that we good-practicing Catholics consume fish and no meats of any kind, so my family and I headed to a great fish restaurant in downtown San Diego, Anthony's Fish Grotto. It's a San Diego favorite and has been a safe place for me to eat, and as a Celiac, there are so many menu options and you never leave dissatisfied ~ quite the opposite, truly yummy. The one thing I will never get over and thankfully so, is seeing all of these new life-joys that my three-year old nephew is experiencing, through his eyes. I love the feeling of remembering how it felt to see a dyed Easter egg for the first time and how excited a child can become over using those wax-crayons to write their name on a pink or purple little oval creation. 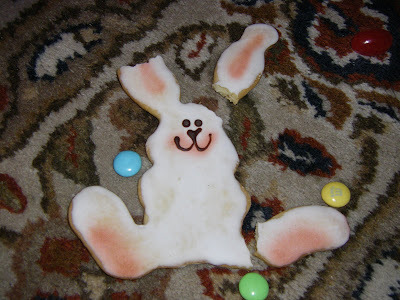 It's beautiful to see and to remember the years of Easter egg hunts after Mass and that feeling of excitement that maybe, just maybe the Easter Bunny visited you the night before and left a basket filled with amazing sugary surprises ~ What joy...though there's some serious hazards that come along with being an Easter cookie when there's a three year old running around! Just a helpful tip for gluten intolerant folks...though we can't eat a lot of the "mainstream" Easter candy we still have a lovely variety to choose from...and not just on Easter - go ahead and indulge all year through. I LOVE Dagoba Organic Chocolates AND the global, earth-friendly story that accompanies the delicious taste of each dark chocolate bite. Image wrapping your taste buds around such flavors/aromas as lavender, mixed with blueberry or the spice of chai or mint-rosemary...shall I continue? The beauty of this gluten-free chocolate extends far beyond the delicious aftertaste - check out their website and the history of the company to see for yourself. Simply wonderful...and lucky me~ my sis-in-law Easter Bunny delivered some Dagoba in my basket this year! 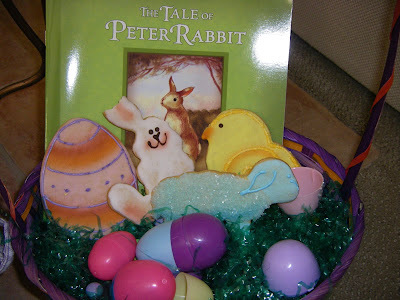 I wish blessings of Easter's abundance for everyone, mixed with a little chocolate and hopefully an egg with YOUR name on it. Happy spring ~ Happy Easter season! It's not all that often you hear a person with Celiac Disease boasting about eating cake and pastries and cupcakes and almond cookies...and oh my! Well, I'm pleased to announce that this past weekend on a quick get-away to Seattle to visit my dear Aunt, I did just that - ate gluten free pastries galore! Going to Seattle or Portland is almost like a pilgrimage for a Celiac, knowing that the Mecca of safe and delicious goodies awaits us all if you know where to go and how to find them. Thanks to Shauna James Ahern, gluten-free blogger extraordinaire and author of "Gluten Free Girl," I was well armed with a multitude of safe places to eat, as well as, from diving in to some of my own research on great places to find wonderful food and treats that fill my soul with happiness and don't poison me! Seattle is the bomb, as the Gen-Y'ers say. On my list of "must eat at's" was a lovely little bakery that's recently moved to the Fremont District of Seattle called The Flying Apron. Bill and Jennifer Dowd, the father-and-daughter pair, who started the Flying Apron Organic Bakery in Seattle's University District, brings a passion for making a better world to everything they do and are now at their new location. When we walked in the door I was overwhelmed by the beautifully arranged breads and pastries filling an entire glassed-in bar, each delightfully labeled with all of the ingredients which I kept reading thoroughly, over and over again, not believing my eyes! Trying to choose a pastry was like buying a new car this particular morning - so many fresh-baked choices that I haven't tasted in almost a decade - oh geez where to begin because let me tell you, one was NOT enough! So after a moist and zesty piece of raspberry coffee cake, it was time to dive into the chai frosted cupcake that my Aunt and I shared...see for yourself ~ oh and don't think I left this bakery without a little pink box of take-home-on-the-plane treats, in hand. 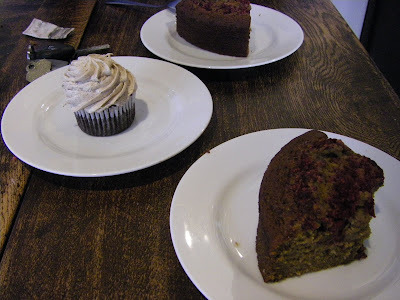 It was truly a delight to be able to walk into a bakery and choose something lovely to eat and to feel "normal"...that might not make sense to those who are able to consume gluten and wheat flour, but trust me when I speak for those of us who rarely stumble upon these hidden treasures when I say, it's special!. Now hoping that I'm not giving off the impression that all I do is eat and seek out calorie-laden desserts, another highlight to my Seattle weekend was a walk through the new Olympic Sculpture Park along the bay. 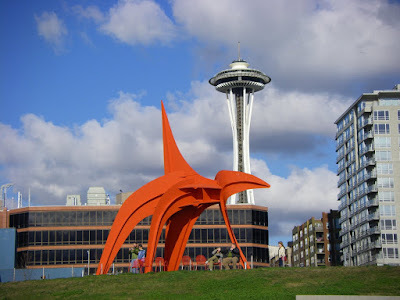 It was built in place of what used to be a landfill and has truly transformed the waterfront giving the natives and we tourists even more beauty to enjoy in the magnificent outdoor setting, while taking in the incredible views and beauty of the Olympic Mountains and Puget Sound. Admission is free to the park, by the way. 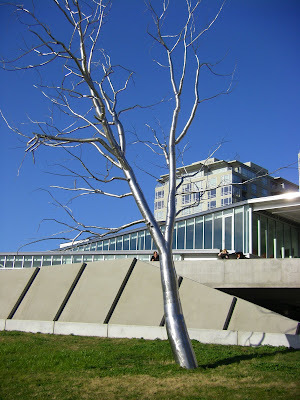 Just one more delight to enjoy while in the Emerald City...and instead of finding the Tin Man, you might run into the Tin Tree. And take a close look - no rain - beautiful blue skies. That "always raining thing" is a myth to keep us tourists from permanently inhabiting their land! Other than discussing my Aunt's incredibly creative and vibrant dwelling place, which IS amazing but a little too private to share with the world, there was one other noteworthy stop on our weekend fun-tour...a lunch at the San Sebastian-style Basque Pintxos/Tapas Bar Txori...aka...little bird in Basque (Euskera). This delightful Euro-style bar was just what the man behind the curtain ordered (get it?Emerald City, Dorothy and the land of Oz) after a morning of walking all around downtown Seattle...in the sunshine I might add. Txori's menu is very authentic, meaning that you do feel as though you are in the Basque Country savoring delicious tortilla Espanola, amazing cheeses, chorixo cocida, and of course some Txakoli Txomin - the Basque bubbly that you won't find in very many locations outside of the Basque Country, oh and we can't forget to mention the flan that we had to try along with our cafe kantoi...espresso, milk, caramel, cinnamon and whipped cream. One last note...Txori's sister restaurant is also located in Seattle...The Harvest Vine, located on East Madison. 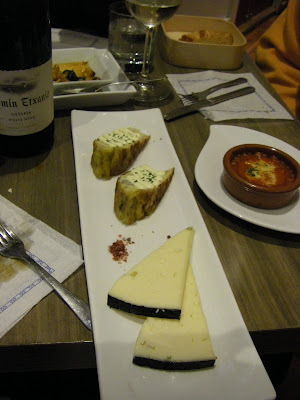 It's definitely more geared towards the food connoisseur looking to experience a traditional, full Basque meal vs. tapas. Boy, do I wish I could just tap my heels together and be back there now, savoring the delights of the Basque Country, right in Seattle. Txin txin to the Emerald City ~ Enjoy! This little beauty is as delicious to taste, as it is scrumptious to look at - take my word for it. In my opinion, the 7 hour drive to Boise or Sun Valley, Idaho is well worth the ensuing reward to the tastbuds that comes from sipping this molten chocolate, espresso, whipped cream delight, and after you indulge your way to the bottom of the cup where only tiny flecks of Mexican chocolate are left to swirl, you will experience the true intention behind its namesake - a filled up soul. 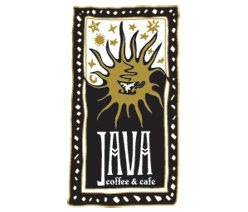 So here's the story - I discovered little Java on Fourth years ago while visiting Ketchum/Sun Valley, ID on a ski trip with a bunch of friends. We all ventured in for a hot treat and a homemade pastry after a rough day sliding down Mt. Baldy (some of us actually skied down)in the below-freezing temperature. I remember being so intrigued with the name of this mysterious beverage, "Bowl of Soul," that I had to order one to find out just what was involved. I still recall the warm chocolate and espresso blend heating up my cold tummy on the way down and diving through the fresh whipped cream that floated so beautifully at the top of the mug, much like a puffy cloud saunters along though the summer sky - surreal in its movement. 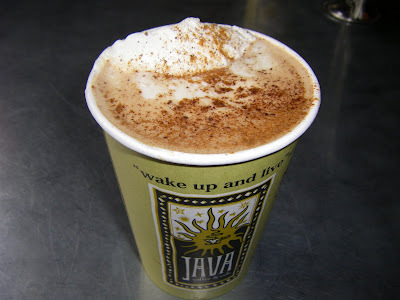 The taste of that drink sank in to my belly and filled my soul with such happiness that I have never gone back to Ketchum without making a pilgrimage each time to Java on Fourth for a refill. Honest. This favorite client of mine indulged in a non-gluten free breakfast of oatmeal, but not just ANY oatmeal...the best looking bowl I've ever seen and I can't even eat the stuff. That's an entire other blog discussion ~ to eat oats or not eat oats...(as a Celiac)...that is the question. I mean look at this beauty. 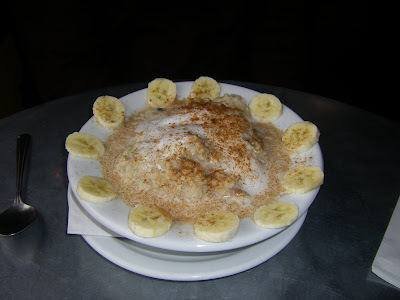 Fresh oats, steamed milk, honey, sliced bananas and cinnamon...with a dollop of foam. The breakfast of Champions...which is ironically what my favorite client truly is...a Champion. Truth be told, this blog entry is not only about a delicious treat, but actually about how I came to choose the name of my blog. As I was brainstorming ideas and scratching out words in my notebook it suddenly came to me..."Hey, what's my most favorite place to visit where my soul is filled with beauty and peace?...Oh, Sun Valley...and where's my special little coffee house haunt?...well,Java on Fourth...okay, AND what's my favorite beverage I look forward to every time?...Ah haaaa the Bowl of Soul, of course!" Those three little words so nicely describe the abundance I was searching for as I set out to create this little snippet of gluten-free enjoyment for anyone who cares to indulge. It was the perfect melding of all I was looking for...don't you just love when that happens?! 3 Tbsp. of freshly whipped cream, or any you choose but PLEASE not out of a can! Steam the milk and cocoa together to create a perfectly blended mixture, then pour in the espresso shot, add the cinnamon and stir. Plop the yummy dollop of whipped cream on the side of the cup and sprinkle the cocoa with abundance! Enjoy the delicious, gluten-free happiness. Happy Friday.